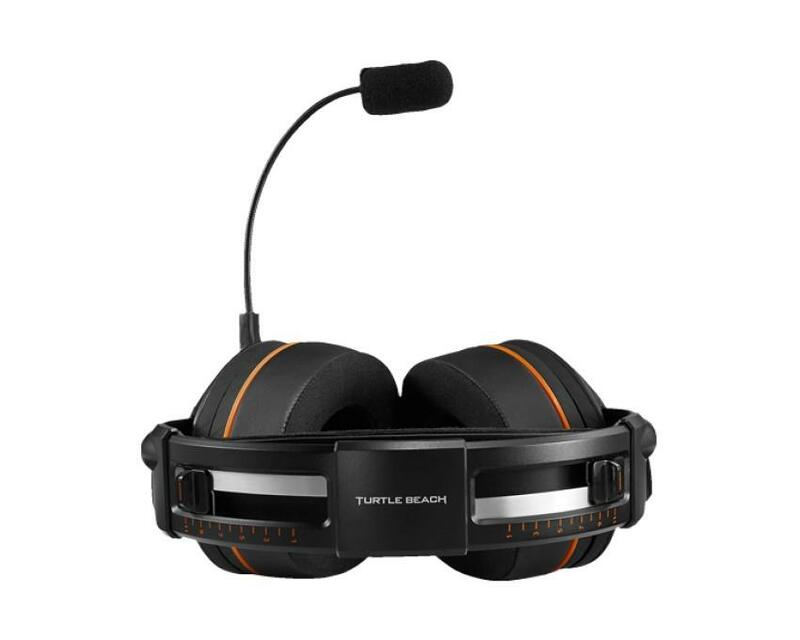 Turtle Beach has enjoyed a long and successful history of providing quality headsets to the gaming world with different features, styles, and quality. Like any audio company, there is always the need to not only improve audio, but improve the comfort and style from time to time in order to keep up with the market. With professional gaming and e-sports truly taking off and becoming mainstream, Turtle Beach felt the need to throw their brand into the hat and create what they feel is the ultimate audio experience in the form of the Turtle Beach Elite Pro Gaming Headset. The Elite Pro Gaming Headset is actually the base piece of what could ultimately end up being a five-piece affair (we'll be covering three of those five pieces in this article) as the add-ons for the base unit includes Tournament Audio Controller, Tournament Noise Cancelling Microphone, Tactical Adapter for Xbox One, and the Elite Pro A.M.P. For Playstation 4. That's a lot to wrap your head around, but Turtle Beach have provided us with the base headset, audio controller, and noise cancelling microphone. The base unit is fairly complex for a gaming headset, which is a good thing as the basic units tend to not be as durable and don't hold up over time in comparison to other units. 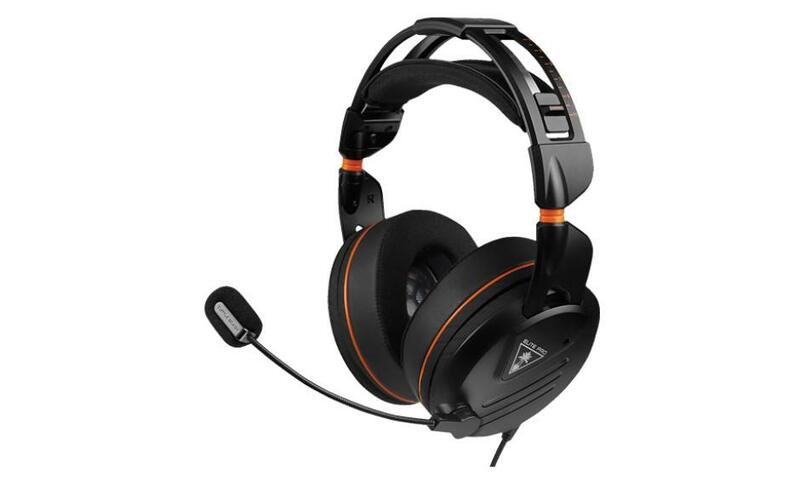 The outer portion of the headset is a solid steel design that ensures durability, while the inner portions of the headset that actually touch a gamer's head are covered in a comfort foam that don't make you realize just how strong the headset is. The earcuffs rotate 90 degrees out to allow for easier storage and have a clearly marked “L” and “R” on either side. A simple connector on the left earcuff connects the microphone, whether it's the standard microphone that comes with the headset or the noise canceling microphone that's extra. The unique part of the Elite Pro is the connection for audio. Instead of using a standard 3.5mm jack, the dongle that hangs off of the headset is a mini-USB connector, though the headset comes with multiple connections for each system, whether it be the Xbox One, PS4, PC, or just general use with a smartphone or handheld gaming system like the Nintendo 3DS. I talked about the trials and tribulations with headsets like this in our review of the Polk Audio Hitman Striker and that it's a bit annoying to have to keep track of multiple cables, but this is the direction that the advanced headsets are going to. Not pulling any punches right out of the gate, I have worn and owned many headsets in my time. This is one of the most comfortable headsets I've ever placed on my head. The cuffs are soft yet I never get the feeling that they are going to slide off or cause any kind of discomfort in certain spots, especially for those who wear glasses. This used to be a major problem for me until I underwent LASIK surgery a year and a half ago, but just to put them to the test, I threw on some Gunnar gaming glasses to see of their claim of the comfort pads being able to accommodate spec wearers and it passed every test. The especially impressive part of this is that these are a closed back headset, so there's no venting. Usually I don't have great luck with closed backs but these have been truly a treat to wear. Honestly, what good is a headset without great sound, though? I ran multiple tests with the headset that both did and did not include the audio controller to see how much of a different there was. Focusing on just the standalone headset, I threw on multiple songs to test the range of the audio through the 50mm speakers. The quality top to bottom is better than I had hoped overall, though I still haven't found a headset that truly wows me when it comes to bass. Yes, 3.5mm connections are going to be limited in what they can do, but even then, low range sounds are necessary though difficult to pull off. There were no issues getting crisp mids and highs, however. So far, I was impressed. I decided that the next test needed to be gaming related, so what better way than to test out game chat on PS4? A simple connection to the PS4 controller and I was chatting with my usual clan on Destiny. I will say that my personal preference when I'm playing a console game is to have a single-ear headset for just chat audio and the game audio coming through my speakers in my living room, so I was always going to be lukewarm on this test. Even then, the chat audio was crisp and my teammates had no issues hearing me. Score another passing grade for the Elite Pro. However, things got a little tricky from here. The Audio Controller is great, but only in one true instance. 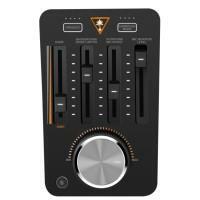 The Audio Controller is a quite impressive, yet easy to use. The primary controller has a master volume knob with four sliders to control the balance between game sound and chat audio, a background noise limiter, an outbound mic boost, and a monitor level. The back of the controller features SPDIF passthrough and does require this connection to get a full connection. In order to connect to any of the systems on top of this, the unit requires a USB connection to the system, which comes included. The digital optical cable that is required with the USB and comes with the controller is some 15 feet long to ensure that there's no problem with distance, but it is very thin and I feel as though my cat could chew through it with one bite. If you have sliding doors on your entertainment system like I do, remembe to disconnect these cords or else you're going to be shopping for a new digital optical cable. For the audio controller, I ran two tests: PS4 gaming and PC gaming. I'm not going to sugar coat this at all: The PS4 setup was a pain to not only connect and get all the cables in a manner that didn't feel like a trip hazard, but calibrating the microphone proved to be a cumbersome issue. Playing with my Destiny clan, I used them as guinea pigs to see what audio sounded the best both with and without the noise canceling microphone. The audio controller seems to want to over-modulate my voice in just about every instance. It took probably a good 15 minutes to get the audio to where it needed to be for just my voice without everyone complaining that they could or could not hear me. The background noise limiter, while a great idea, works so well that it can actually cut out your own voice with little issue. The mute button that is on the controller actually flashes when it detects your voice, and turning it up to just the third or fourth notch with the noise canceling microphone would completely kill my voice. To be fair, once I did get it set up to where it needed to be, I was told the audio was great and I was clear, but it still had the over-modulation problem from before. Overall, I feel like the audio controller wasn't truly meant for the consoles. Now, I want you to wipe everything in the paragraph above from your memory because I had none of these issues when playing on my PC. Calibrating my voice for Ventrilo or Mumble took about a minute and none of my fellow gamers said there were any issues. I sounded great through the server and both my friends and my game sounded better than ever. I've spent time raving about my current PC gaming headset, the ROCCAT Kave 5.1 XTD, but I think I may have worthy challenger. Turtle Beach knows that e-sports are for both consoles and PC, and after running the tests with the audio controller, I truly feel that this headset and the accessories were made for PC gaming with consoles getting the connections afterwards. This isn't anything new I'm bringing the table, it's just a fact that PC compatibility is generally easier to pull off. Turtle Beach has provided a headset with optional accessories that any gamer would be proud to have, with a caveat or two in fine print. I would have no problem using the Elite Pros as just my standard headset for music at the gym or for playing games on my smartphone on 3DS. It's also great for my consoles, but not with the audio controller. The audio controller definitely works the best with my PC and it will stay with that rig. I cannot stress enough, though, just how comfortable this headset is. If comfort is your biggest challenge, especially if you wear glasses on a regular basis, this is the headset you absolutely need to get. The base headset retails for $199 while the audio controller retails for the same price. The noise canceling microphone goes for an extra $30. 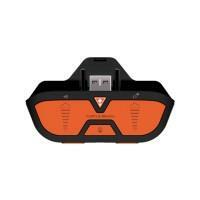 All can be found on Turtle Beach's website or on Amazon and other major online retailers. Comfort and quality are the name of the game with the Elite Pro Gaming Headset. While the audio controller leaves something to be desired when connected to the PS4, the combination truly shines on the PC. 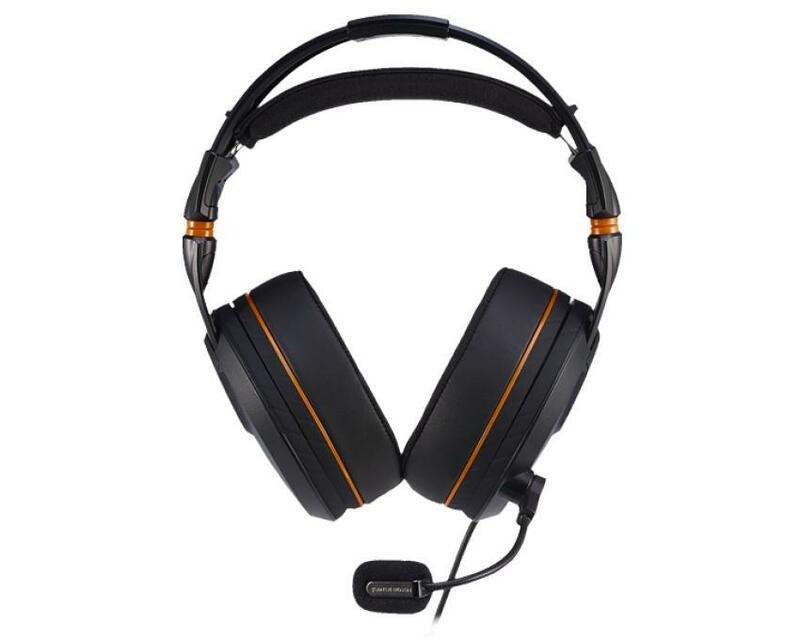 Besides the calibration issues, the audio is gorgeous and the headset can be worn for hours at a time without an issue. 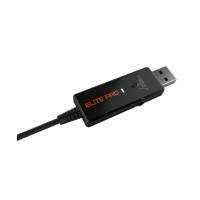 Turtle Beach hit a home run with the Elite Pro.